CORR-The Jute Works usually attaches importance to preventive health care program. We arrange vitamin capsule 'A' program for group members. It will be no exaggeration to mention here that we are able to give information regarding primary health care to the producers. Particularly pregnant women follow our suggestions. They take special care of themselves and give birth to healthy babies. CORR-The Jute Works has taken a new scheme to meet the need for producer’s medical support. Producer can have the opportunity of financial assistance for her treatment in hospitalization, operation & serious cases. Want of pure drinking water is major problem in the rural area. The producers were habituated to drink pond and river water, which is not at all hygienic. After learning the purity of underground water, many of them have installed deep wells. CORR-The Jute Works have distributed deep wells and contributed to set them up. Producers who do not have deep well near to the village, purify and boil the drinking water. Use of the sanitary latrine in the rural area was rare. People would go to Jungle or field to relieve nature. Since CORR-The Jute Works succeeded in motivating the producers to adapt to sanitary system, gradually the situation has changed. At present most of the houses are furnished with sanitary toilets. CORR-The Jute Works has provided a number of sanitary toilets for the rural women producers. The women producers participate in sapling distribution programs of CORR-The Jute Works every year. To take impart the producers in keeping ecological balances, the sapling distribution program attaches importance in the environmental activities of CORR-The Jute Works. Whenever the producers are affected by a natural calamity, CORR-The Jute Works assists them in cash and kind according to its resources towards partial recovery of the loss. Extra job orders are procured through sales drives and given to the affected for additional income to be able to repair the damage. CORR-The Jute Works maintains training, counseling, placement service and community development activities. We maintain contribution performance, encouragement of employees to participate in social projects and community development activities. We support of minority enterprises, investment practices and government relation. We maintain work environment policies, accident safe guards, food and medical facilities for employees and producers. We are preventing environment pollution and we have evaluation procedures of new packages and products. CORR-The Jute Works provide current recruitment policy, advancement policy, specialize career counselling and opportunity for women. Our goal is to increase women's participation in the socio-economic development work. 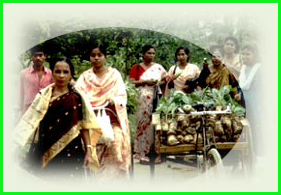 CORR-The Jute Works involves women in the vital position of the organization. To provide the strategic directions in terms of organizational planning, designing, implementation and impact assessment of women, our gender policy is to increase women's participation.